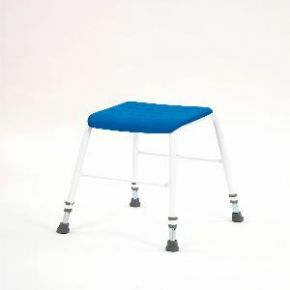 Deluxe Padded Perching Stool For Comfort In The Shower. As befits a top of the line perching stool, this model is height-adjustable to best suit the user. The frame is very strong and will accommodate users up to 25st or 157kg in weight. It will fit easily into most shower cubicles and still allow room for movement. A good sturdy stool with a nice comfortable seat , I use it in both the kitchen and bathroom but I am going to purchase an additional one.